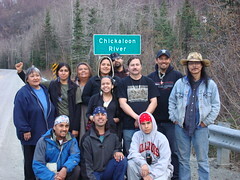 Chickaloon, Alaska. These are the folks from the fish hatchery. they used to hatch salmon eggs here and release them. Chief Gary Harrison, Harry a mean blues harmonica player, Anabel and Faye from Copper Center are in the picture.